… a pair of oak speaker stands, or posts, if you will, are finally ready. Each such stand weighs over 9 kg. Oak wood is very heavy. 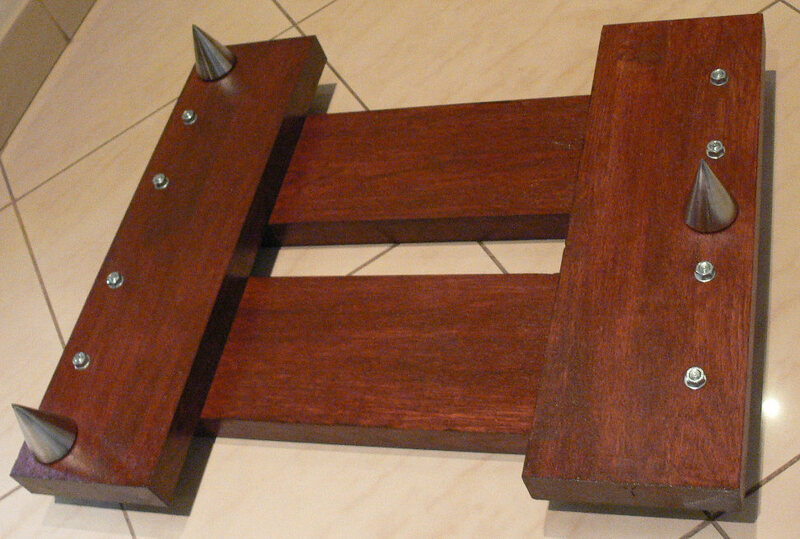 The spikes, as mentioned earlier, are plumbs from a construction market (300g, 45mm dia, 70mm high). 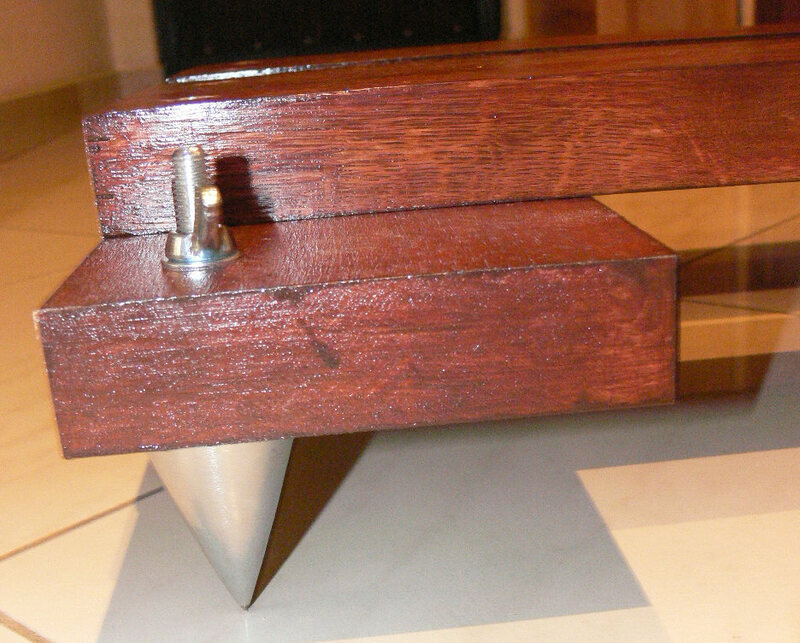 Mounted on a piece of M10 threaded rod with butterfly nut. 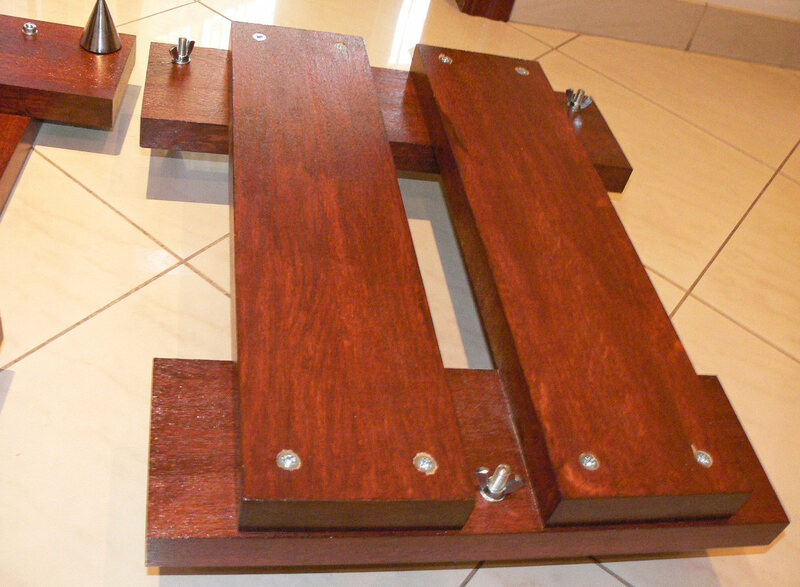 The boards are bolted together with 8 bolts of type M8 x 80. Optionally will consider additional 8 bolts of same type, for a total of 16. In such a scenario, each corner of the rectangle would be bolted together with four bolts. But from what it currently seems, it is sturdy enough, as it is. The speakers shall be placed on top of the longitudinal boards, on big round elastomer washers. 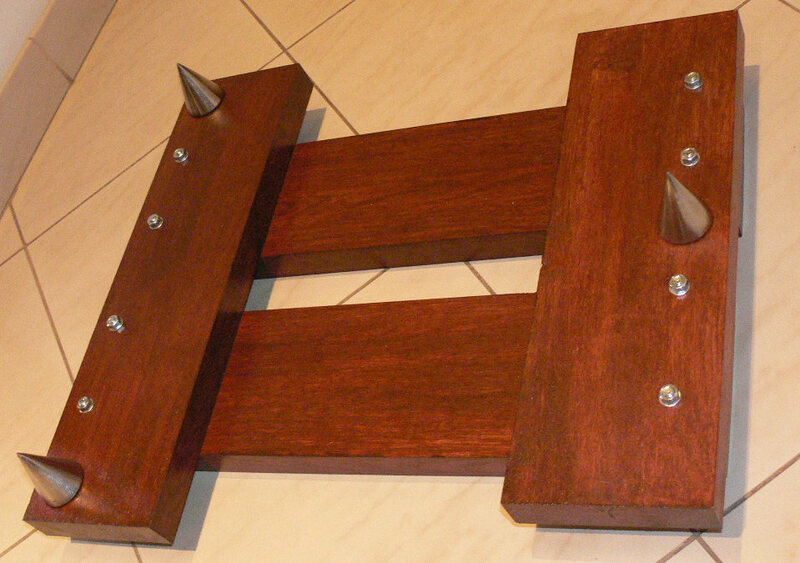 This is but only the “option A” of the possible mounting of the spikes. This scheme allows to achieve maximum height of the stand and maximum elevation of the speaker. An alternative scheme would simply encompass bolting the spikes to the board from the other side, hence allowing to achieve a “low profile” type of stand. But then the speaker would be standing on the two traverse boards, rather than on the longitudinal ones. After some long pondering about the subject, I finally selected and used the bolts with the conical type of head. By means of using a thicker drill bit, I made a slight cavity in each of the top board holes, and hence made it possible for the bolt to nicely disappear under the surface of the wood. From the top side, no metal shall be touching the cabinet of the speakers. 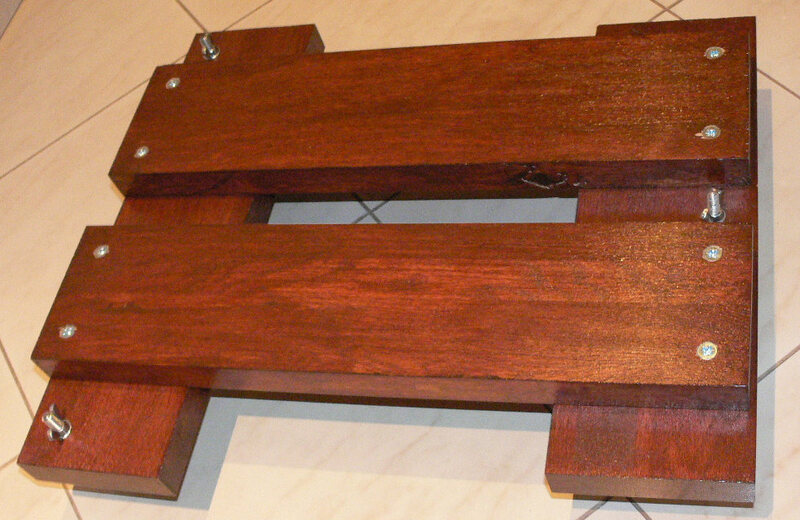 Optionally, shall consider covering the bolts with a splash of the mahogany varnish, so that they are less obtrusive, visually, at least. Why am I linking up to them ? Because I like them. Already “tested in battle” within the tweeter-&-midrange department. Big: 40mm; nicely finished, constitute good value for money. A whole set of 8 pieces for c.a. 10 EUR is a bargain. I use them. Maybe you will also want to consider them. An optional add-on: some elastomer feet underneath. Such elastomer material may be sourced from www.poliuretany.pl . 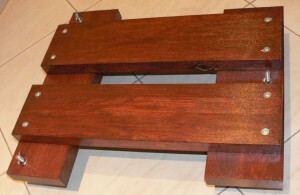 Oak board 1000 x 300 x 45 mm = 30 EUR. Oak board 1200 x 300 x 45 mm = 38 EUR. Cutting service = 2 EUR. Set of 32 bolts, nuts and washers = 8 EUR. Small can of mahogany tinted wood varnish = 9 EUR. All “stuff” purchased at Leroy Merlin Construction Market. P.S. Don’t ask for the “oak boards” – because they will be astonished and simply say that they “do not have anything like that”.